Before I get into the main topic of this article, I’d like to familiarize the readers with a brief history of the 1033 transfer program, the origin of the Special Weapons and Tactics Unit, as well as the Posse Comitatus Act of 1876. The special weapons and tactics concept originated in the late 1960s as a result of several sniping incidents against civilians and police officers around the country. Many of these incidents occurred in Los Angeles during and after the Watts Riot. Upon critical examination of how each incident was managed by police, the leadership of the LAPD realized that an effective response to these dangerous situations was virtually non-existent. Officer John Nelson presented the special weapons and tactics concept to a young inspector by the name of Darryl F. Gates. Inspector Gates concurred and approved the concept of a small group of highly disciplined officers utilizing special weapons and tactics to cope with these unusual and difficult attacks. (the focus was to be on barricade, hostage, and active shooter situations NOT warrant searches). The Posse Comitatus Act of 1878, still in effect, was passed to prevent U.S. military personnel from acting as law enforcement agents on U.S. soil. Today, the Posse Comitatus Act has taken on a very different meaning from the one that it had in 1878. No longer associated with reconstruction from the American Civil War, it is a useful way to prevent the U.S. armed forces from directing their efforts against U.S. dissident groups. The militarization of our police force has become a pretty hot topic, with much of the emphasis being placed on the equipment, tactics, and the justification to use the aforementioned items during civil policing within our own borders and on our own citizens. I write this article from a unique perspective of being a 21 year veteran of the U.S. Army, seasoned infantry Soldier with two tours in Iraq (27 months), as well as being a master gunner and trainer with a vast amount of knowledge of military weapons, tactics, rules of engagement, and escalation of force. As a professional Soldier, I cringe when I see the local police all “kitted up” looking like they belong more in the mountains of Afghanistan or the streets of Iraq than on the streets of Any Town, USA. There is a big difference between playing dress-up and looking like a Soldier, than actually having the discipline and knowledge of actually being one. Soldiers spend countless hours, days, and weeks supported by millions of taxpayer dollars perfecting their individual skills such as marksmanship training on their primary and alternate weapons, how to wear and use equipment like the gas mask, first aid kits, and night vision. When it comes to weapons training, they study and practice the fundamentals of basic rifle marksmanship to include exercises like grouping and zeroing, basic qualification and finally progress to night-fire with night vision goggles and lasers. Once the basics are completed, they move onto progressively harder exercises to include judgmental shoot-don’t-shoot exercises or target discrimination exercises. Once a Soldier has shown mastery of their individual level tasks they move into a buddy system and start the process all over. Eventually, they are combined with the rest of a team (4 personnel) and then squad (9 personnel) and work on their collective exercises such as entering and clearing a building, react to direct fire, detainee operations, etc. Training is always based on the crawl (classroom and theory), walk (blank, simulations, or dry fire training) and run (live fire). Whatever the Soldiers do at night, they have first perfected during the day. They are also required to qualify semiannually on their weapons and in most cases, recertify as a squad and collective tasks annually. During combat operations, Soldiers go through a very rigorous Rules of Engagement briefings and in most cases rehearse it prior to each and every mission. Specific points of discussion are threats whether perceived or direct, collateral damage, escalation of force, proportionate force, and hostile intent. All of which appear much more restrictive than many of the “No-Knock” warrant raids and weapon’s discharge incidents conducted by our police and SWAT teams. For example, the rules of engagement I operated under during a time of war would not have allowed the Waco police, during the Twin Peaks incident to shoot into a crowd with the back drop being a restaurant full of innocent people, or the Orlando office that killed an innocent bystander last year. The rules of engagement don’t only include when you may or may not shoot someone, but also gives guidance on the escalation of force to include warning shots, disabling shots (vehicles), non-lethal/less than lethal, pyrotechnics, etc. Soldiers are continuously reviewing and adjusting their techniques based on lessons learned and enemy techniques, tactics, and procedures. On the battlefield the last thing we want to do is kill innocent civilians and create more enemies. The police and SWAT teams don’t appear to be overly concerned about this when they “perceive a threat” in the course of their duties. Something else that is continuously reviewed and improved upon is when you may or may not detain a person, how to search houses, and the handling of non-combatants. Soldiers are trained on biometrics for iris scanning, gun powder residue testing, site exploitation, evidence gathering and documenting, and detainee handling. All of which emphasized the point of treating people with dignity and respect whether they are enemy combatants or civilians caught up in a war. The rules we operated under during battle certainly would not have allowed the wholesale detention of 177 citizens for the sole fact they were near an incident or witnessed an incident such as the Twin Peaks, Waco shootings. During the fight overseas, many operations revolve around conducting raids on houses either looking for high value targets, caches, bomb making factories, or command and control sites. Prior to each mission, even if it is a time sensitive mission, the Soldiers go through an intelligence gathering period where they pinpoint the house, get satellite imagery, watch the target house for occupants and routines, and find out the best way to enter the building as well as looking at alternate methods to accomplish the mission, and then craft a plan. Once the plan is made, a mission packet with risk assessments, operational graphics, scheme of maneuver, and various members of the chain of command’s approval is pushed up through the ranks, and in some cases receive approval by an attorney. All of this is to make sure we hit the right target, and use the appropriate level of force, and we are not violating any person’s rights. Of course there is much, much more details involved, but I wanted to take time to bring to light the many different key factors that come into play when it comes down to doing military style operations correctly. Regardless if it is in Ramadi, Iraq or a house in Daytona Beach, FL, we must have the best of the best on the front lines to ensure the operation is performed with the utmost professionalism and everything has been put it place to mitigate risk for the citizens and the officers. The police have been getting military grade equipment that range from aircraft, sniper rifles, clothing, communications, intelligence equipment, body armor, etc. But they are NOT doing the appropriate level of training to ensure they are proficient with their newly acquired equipment and tactics. The lack of proper training is obvious when you base it upon the amount of botched raids on the incorrect houses, weapons mishandling, unjustified shootings, shootings that are suspect of negligence but not proven due to the person being dead or lack of evidence, amount of people killed without a weapon being found, and finally fratricide (shooting your own guys or what the police have coined Blue-on-Blue). What is even more alarming is the lack of local accountability during these incidents to include the military style raids or the lead up to them. An Ocala police officer died Monday evening after he was accidentally shot during firearms training. Ocala police said officers were just wrapping up from the firearms course. An officer was unloading a 40 caliber Glock, semi-automatic gun when it discharged. Timothy Huggins, a 16-year veteran of the Edgewater Police Department, [negligently] discharged his firearm [5.56mm rifle] as he and another officer were at a home in the city checking out reports of a hostage situation, Edgewater police Capt. Joe Mahoney said Tuesday. Maria Fernada Godinez, 22, was inside the club when Orlando Police officer Eduardo Sanguino aimed to shoot at an armed suspect but struck Godinez instead. The deputy, Todd Raible, 36, fired once, shooting Cruice in the face just inside the doorway of the home just after 6:30 a.m., Davidson said. “It has since been determined that Cruice wasn’t armed,” Davidson said. The Daytona Beach Police Department was suspended after reporting a lost M-16 in January. “We still have not been able to find it,” Daytona Beach Police spokesman Jimmie Flynt told Cox. When was the last time the officers were certified on their primary and alternate weapons? How often do the SWAT teams recertify on their personal weapons? What was their qualification score? Did the officer and team receive escalation of force training and threat/target discrimination training? What was the standard they were trained to? How long has the SWAT team worked together as a unit? What standards does the SWAT team train to (urban operations, breeching, room clearing, etc.)? Have the SWAT team members trained in hand-to-hand and close quarters combat? If so, to what standard? What was the SWAT team’s collective evaluation score if certified (live fire, blanks, walk through)? Were rehearsals conducted prior to the raid (walk through rehearsals, sand tables, shoot houses, glass houses, etc.)? Was there a thorough reconnaissance conducted prior to the raid? To include blueprints of the house, number of personnel in the house, animals, etc. Were the SWAT teams trained with night vision and lasers? When was the last time they certified and or conducted night/limited visibility qualification? Were there any less-than- lethal or nonlethal weapons available? Who in the chain of command approved the operation? What were their credentials? 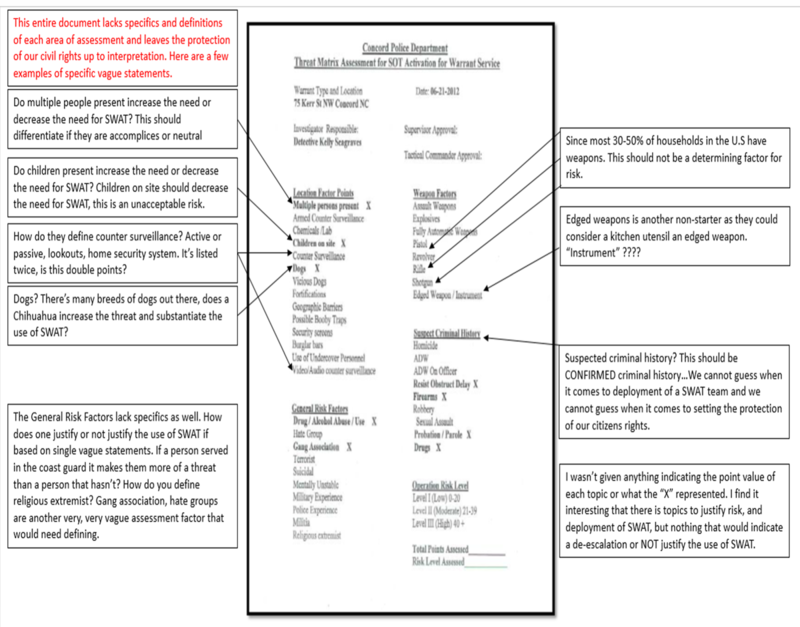 Was there a threat matrix completed, if so, how quantifiable were the assessments that elevated the operation to a SWAT style raid? What were the officer’s physical fitness scores and health at the time of the incident? All these questions are questions that would be asked if a Soldier were to kill a friendly or noncombatant on the objective. We should expect no less from the police on the home front. It’s imperative that the civilian population knows the extent to which a Soldier prepares to go into battle. He and his team become one with his weapon and with his team members. They continuously train in stressful situations and keep their bodies in peak physical shape to help them deal with the stress of the unknown. The teams are very comfortable going into many unknown situations and are prepared for multiple contingencies. This relentless training allows the teams to focus on the task at hand and not be distracted and or make poor decisions because they are not familiar with the basics of their gear, team members, or weapon. Conversely, if an officer isn’t trained to the same standards, it gives them doubt and uncertainty. This in and of itself can cause mistakes on the job and on the objective. Mistakes can cause fratricide and unjustified killings. Due to tight budgets, lack of resources and facilities, and competing duties, it’s not unreasonable to assume that the SWAT personnel and the average officers are not afforded the same opportunities to train like Soldiers. However, they are still getting the same equipment and expected to handle the equipment like professionals throughout the course of their duties, especially during SWAT deployments. On the flip slide, if the SWAT teams and the average patrol officer are trained to the same level as a Soldiers, what makes them any different than regular Soldiers? This begs the question if they look like Soldiers, and are equipped like Soldiers, and are trained like Soldiers – then what’s the difference? How does Posse Comitatus come into play? 79 percent of the incidents the ACLU studied involved the use of a SWAT team to search a person’s home and more than 60 percent of the cases involved searches for drugs. The use of a SWAT team to execute a search warrant essentially amounts to the use of paramilitary tactics to conduct domestic criminal investigations in searches of people’s homes. Of the SWAT deployments, only a small handful of deployments (7 percent) were for hostage, barricade, or active shooter scenarios. Estimates indicate the number of SWAT teams in small towns grew from 20 percent in the 1980s to 80 percent in the mid-2000s, and that as of the late 1990s, almost 90 percent of larger cities had them (P. Kraska). The number of SWAT raids per year have grown from 3,000 in the 1980s to 45,000 in the mid-2000s (P. Kraska). The value of property transferred though the 1033 program went from $1 million in 1990 to $324 million in 1995 and to nearly $450 million in 2013. The ACLU filed public records requests with more than 255 law enforcement agencies during the course of their investigation. One hundred and fourteen of the agencies denied the ACLU’s request, either in full or in part. There is almost no oversight of SWAT at the federal, state, or local level. 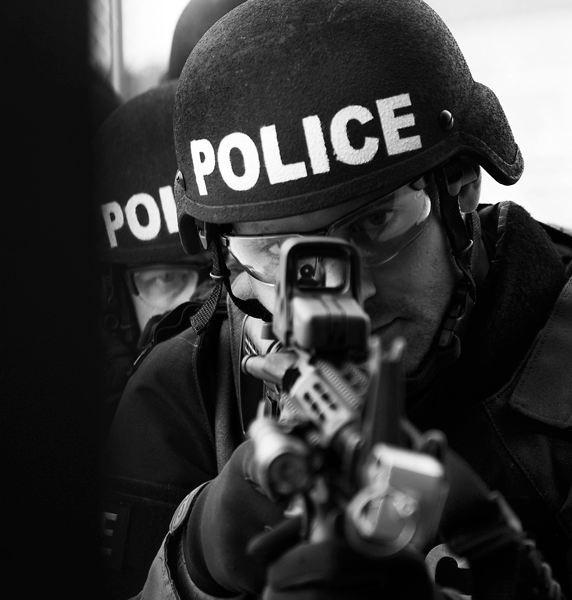 Maryland is the exception—in 2009, Maryland enacted a law requiring law enforcement agencies that maintain a SWAT team to report, semi-annually, specific activation and deployment information. Another concerning issue is the lack of accountability and government oversight of the SWAT teams and the unwillingness to prosecute officers or have independent investigators come to investigate a suspected bad shooting or bad raid. “To charge an officer in a fatal shooting, it takes something so egregious, so over the top that it cannot be explained in any rational way,” said Philip M. Stinson, a criminologist at Bowling Green who studies arrests of police. “It also has to be a case that prosecutors are willing to hang their reputation on.” The average is 1 in 1,000 are prosecuted (Bowling Green, 2015). In conclusion, I want to state that we as United States citizens must hold our local, state and federal policing agencies accountable. No one is above reproach. If our Soldiers fighting for our freedoms overseas are held to a high standard, the personnel that are sworn to protect and uphold our laws on the home front should be too. Every SWAT team deployment and officer mishap should go through the highest level of scrutiny before, during, and after deployment to include any questionable incident involving an officer. When it comes to SWAT deployments, a public defender or independent attorney should be one of the approving authorities and accompany the SWAT team on the mission. We cannot rely on the police to police themselves and investigate a bad situation. We should also be afforded the opportunity to have an independent expert challenge the training and tactics of the police departments and the SWAT units. We the People need to demand accountability of our police who work for us. The accountability should be in the form of transparency in all they do to include training records and processes, timely release of videos, body cameras for all officers, investigations, autopsy reports, ballistic reports, gun powder residue results, independent review of SWAT training records and procedures, equipment inventories, and protocols for use of various military equipment just to name a few. We should not treat Americans with less dignity and respect than we do citizens from other countries during a time of war. It’s time to speak out and challenge the way our police operate. I urge each and every one of you to take stock in our local and state law enforcement’s actions and build the proper support structure to protect our citizens against an under trained and over equipped police force. For our lawmakers – please consider pushing legislation that will protect us and give the necessary oversight to instill confidence in our society and reverse trend in society’s eroding trust in the people that are sworn to protect us.